Tobermory is located at the tip of the Bruce Peninsula. Like many other towns and villages in this area, it takes it name from an older settlement in Scotland. 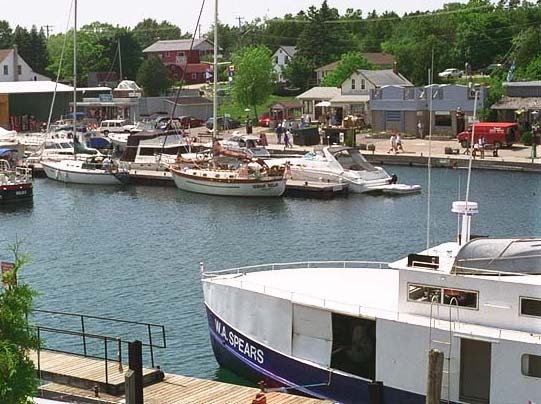 This picturesque and busy harbor town is the gateway to Georgian Bay for boats approaching from Lake Huron. Little Tub Harbour is a popular stopover for cruising sailors, as well as the home port for a commercial fishing fleet, a large number of dive boats, and several glass-bottomed tour boats. Despite all the marine traffic, the waters of Tobermory and surrounding Georgian Bay are remarkably clear. 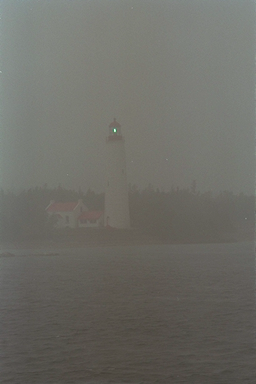 In Georgian Bay, underwater visibility often exceeds 70 feet. In the harbor itself, you can easily see over fifteen feet to the bottom. There are several wrecks in the eastern cove of Little Tub Harbour which can be viewed by snorkeling. Surrounding Tobermory is the Five Fathoms National Marine Park, an underwater preserve of shipwrecks that attracts thousands of sport divers. Nearby Flowerpot Island contains unique rock monoliths. Over time, erosion has shaped them to resemble flowerpots, and hence they have lent their name to the island. Several different tour boats bring hikers to the island for a trek. Here, Highway 6 ends at the loading ramp for the Chi-Cheemaun ferry, which bridges the 35 mile gap to South Baymouth, Manitoulin Island. Traffic comes and goes in a large pulse of vehicles every four hours, synchronized by the arrival and departure of the ferry. In between, the docks and shops are filled with people. For the traveler waiting for the ferry, there are many fine stores filled with souvenirs, books, and fine art. For more information: www.tobermory.org website!